If you have any questions or want to enquire about dates, use our form to contact Dominique Casaromani-Fillon or see their website for more information. Up a quiet lane, embraced by woodland and fields, an exceedingly fine manor house with dovecot, orchard, barn, pool and flourishing potager. Friendly Dominique welcomes you in, and treats you to a wonderful table d’hôtes. Spacious beamed bedrooms – four reached via a stone turret stair – are full of traditional comfort, and the dining room is inviting, with blazing logs, light-flooded windows and a great big convivial table. This is the Loire and there are châteaux by the hatful: Chenonceaux, Loches, Amboise, Azay le Rideau, Villandry. A great find, and good value. Dinner with wine, €27. Restaurants 5km. Singles €70. Dinner, B&B €25 per person. Charming, relaxed, welcoming. One of the best B&Bs we have experienced in France. Lovely cuisine and delightful sociable dinners and breakfasts. A privilege to stay here and looking forward to the opportunity to stay again. I feel very fortunate to have spent my final night in France in such a magical place. Le Manoir de Chaix is ideally situated for breaking a journey across France; but despite it's convenient proximity to the A10 and A85, it feels as though it is in the middle of nowhere - incredibly quiet, with dark night skies and surrounded by acres of woodland and countryside. It's a beautiful building with a lovely walled garden - in which Madame grows much of the produce that appears on the table. Big, airy rooms, lovely views, a warm welcome. Highly recommended! Brilliant host in Christian and what a cook! Several people were there for the fourth or fifth time, which in itself speaks volumes. Superbly placed for the chateaux. I have already had a request to do a revue (in French) for the Manoir de Chaix. It was good when sending e-mails, they indicated to just put Manoir de Chaix into TomTom, and it would take you straight there: it did. Our third visit and ideal distance from Roscoff for a day's journey. So quiet and peaceful, everything calm and comfortable, and the added benefit of a delicious dinner (requested in advance) with other guests. Breakfast is a challenge to select from about 24 home-made jams incluidng tomato and cucumber, all delicious. 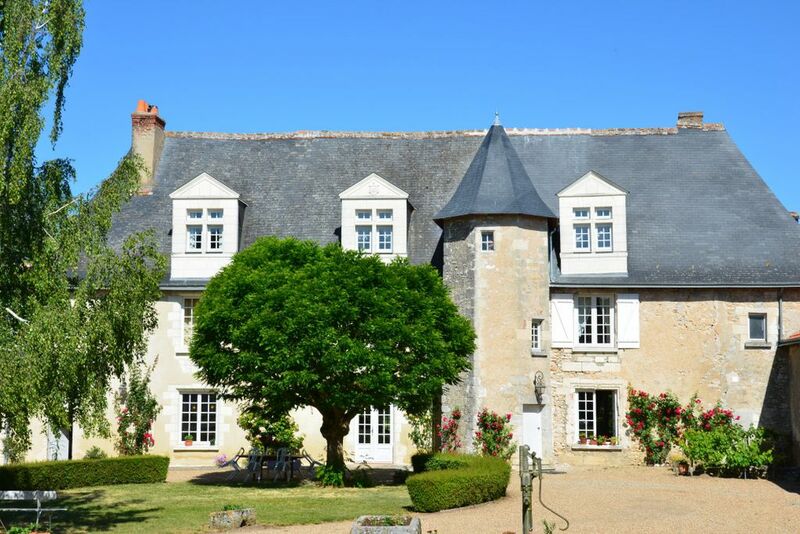 Great Manoir, beautiful location, tranquil setting and ideally placed for visiting Chateaux. Warmest of welcome by Christian a great chef. Will go back soon. What a fantastic place! A charming building, beautifully restored in a lovely and peaceful location. Hospitality was excellent and the food incredible - the beef was perfect! Many things were produced from the garden and were, pretty much, as good as it gets! I highly recommend a stay in this interesting and very friendly place. A great place to stay and really convenient for visitors to the Loire valley. Comfortable and well appointed room in a Manoir of great character. Breakfast sumptuous with an array of preserves, 20 in all, with labels to severely test your knowledge of French! Would happily return if travels take us to that region again. One of the loveliest places we have stayed; a beautifully restored manoir in keeping with visits to some of the grandest chateaux of the Loire! The room was large, luxurious and beautifully furnished. The hospitality could not have been better; aperitifs in the garden before dinner, wonderful cuisine with home grown vegetables and excellent local wines complimented by stimulating conversation around the large dining table. Breakfast was a delight with a choice of 20 different preserves; a hard choice for early in the morning! Thank you and we will definitly try to come again! Really lovely, one of the best places we have stayed at. Most impressed with Christian's cooking, especially the 20 varieties of home-made preserves at breakfast.